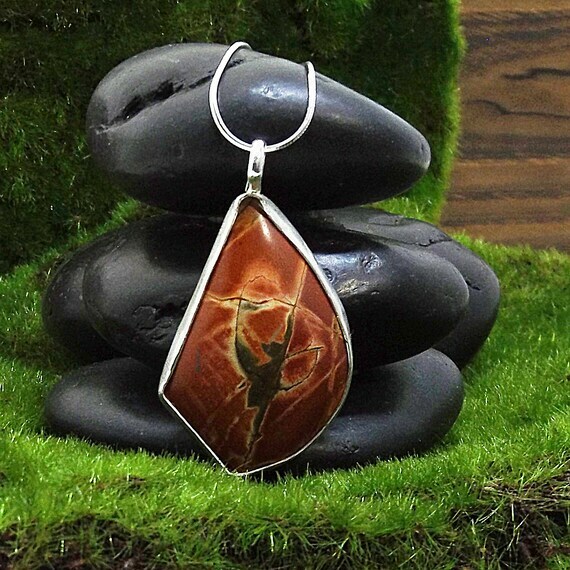 Cherry Creek Jasper is a colorful jasper with intriguing patterns. This jasper stone is frequently found with hues of reds, yellows, and greens. This gemstone resonates with all who wear it, but it resonates the strongest with the zodiac sign Leo. This Cherry Creek Jasper pendant measures approximately 2.1” long by 1.2” wide. The jasper cabochon is secured in a handmade sterling silver setting and suspended on an 18” sterling silver snake chain. Cherry Creek Jasper is known as the Supreme Nurturer as it provides grounding and stability to those who wear it. This stone sustains and supports in times of stress, and absorbs negative energy to protect the wearer. Cherry Creek Jasper stimulates the imagination as well as your quick-thinking reflexes. The stone also strengthens your problem-solving abilities.